Day four of competition at the 2017 Adequan/FEI North American Junior & Young Rider Championships (NAJYRC) on July 22, 2017 saw the Canadian eventing athletes shine. 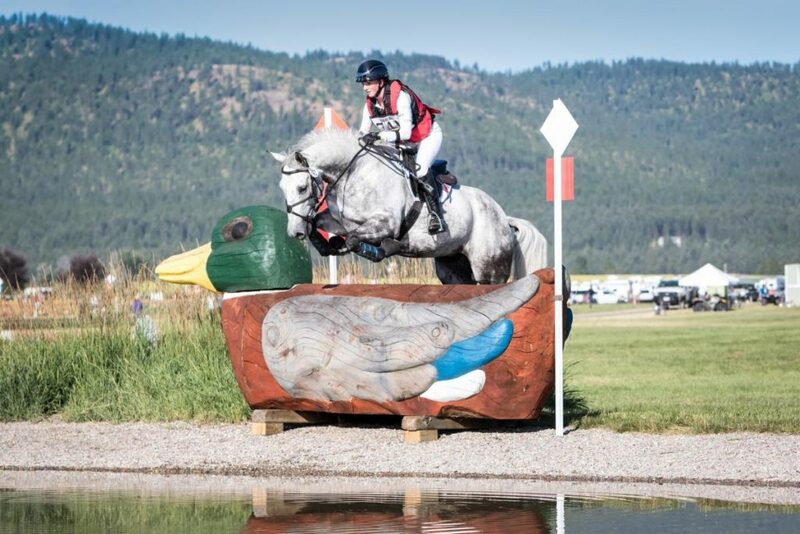 After taking an early lead following the dressage phase on July 21, the Canadian Young Rider Eventing Team put in impressive cross-country performances to stay at the top of the pack on July 22 at Rebecca Farm in Kalispell, MT. Together, Anne-Sophie Levesque of Cochrane, AB, Annick Niemuller of Goodwood, ON, April Simmonds of Uxbridge, ON, and Emily Thompson of East Gwillimbury, ON, finished day two of the CICOY 2* division on a total team score of 180.8. US Area I/IV took over second with 182.0 and US Area VII is holding third place on 182.8. For the second day in a row, Thompson, 19, was the top-placed Canadian, having maintained her fourth place position from dressage after adding no jumping and just 6.4 time penalties cross-country. Partnered with Paddington, a 12-year-old Thoroughbred / Connemara – cross gelding sired by Yavari and owned by Lisa Thompson, she is heading into the final show jumping phase on July 23 on a score of 55.8 penalties. Cornelia Dorr of Area I/IV kept her lead in the individual standings with a score of 37.0 aboard Louis M.
Levesque, 19, was the team member who made the biggest move up the leaderboard after cross-country. She came into day two in 11th place, but after being the only Canadian to achieve a double-clear cross-country round, she shot up to seventh place and kept her dressage score of 59.5. Levesque was partnered with her 11-year-old Canadian Sport Horse gelding, Eskapade (Portland L x Golden Art). Simmonds, 19, moved into 12th place on a score of 65.5 penalties after adding no jumping, but 11.2 time penalties during cross-country aboard Impressively Done, a 12-year-old Thoroughbred gelding she co-owns with Faydon Enterprises Ltd. Niemuller, 18, will head into show jumping in 16th place on a score of 87.9 aboard FE Black Jack (Blackstone x Severus), a nine-year-old Dutch Sport Horse owned by Karl Niemuller. Canada’s Junior Team moved up from fourth place after dressage to hold second on a score of 153.2 after three team members put in foot-perfect performances on cross-country on July 22. US Area I is in the lead with 148.4, and US Area VI is in third (157.6). American, Megan Loughane is holding first place individually aboard Linford with a score of 45.0 penalties. Currently leading the Canadian team is Tosca Holmes-Smith, 17, of Chase, BC, paired with Fiat (Cats at Home x With Approval), Ali Holmes-Smith’s 13-year-old Thoroughbred gelding. After scoring 47.2 in dressage she was in eighth place, but shot up to third following her double-clear cross-country effort. Next on the leaderboard for Canada is Chloe Duffy, 16, of Sombra, ON and Oro Veradero, her 10-year-old Thoroughbred gelding. The duo moved up an impressive eight spots by keeping to their dressage score of 52.7. Caledon, ON native, Ella Marquis, 14, also enjoyed an eight-spot leap up the standings, from 21st to 13th, due to her clear cross-country run, paired with Meadowbrook’s Pollyanna (Pikasso x Jacobean), a 14-year-old Dutch Warmblood/Rhinelander-cross mare owned by Mark Marquis. Together they will enter the show jumping phase on their dressage score of 53.3. Unfortunately, team member, Eva Marquis retired on cross-country with Hollywood, also owned by Mark Marquis. Prior to cross-country, Eva and Hollywood contributed a dressage score of 54.3 to the team. Yanina Woywitka, 17, of Merrickville, ON wrapped up the Young Rider Dressage division on July 22 with a ninth place finish in the Freestyle at HITS Saugerties in New York. Partnered with R’Myattack (Rheirattack x Wanderbursh II), a 10-year-old Oldenburg gelding owned by Susanne Dutt-Roth, she earned a score of 67.050% from the judges. Teammate, Alexandra Meghji of Toronto, ON wasn’t far behind. The 19-year-old scored 66.975% for 10th place riding Rigo (Rotspon x Weltmeyer), a 16-year-old Hanoverian gelding owned by Diana Belevsky. The Freestyle was won by Chase Shipka of USA Region 1 aboard Zigal on a score of 74.650%. Jumping competition at NAJYRC continued on July 22, with the Junior/Young Rider and Children’s Farewell Competition, which saw two Canadian Junior athletes participate. Following the first two Jumping Individual Qualifiers, the top 25 athletes were invited to move on to the Individual Final on July 23, with all remaining athletes invited to participate in the Farewell Competition, consisting of an initial round followed by a jump-off for clear entries. Cassie Gorsline, 15, of Okotoks, AB had an initial clear round aboard Siempre Salsa (Stolzenberg x Sacramento Son), a 13-year-old Hanoverian mare owned by Lisa Carlsen, then returned to the jump-off to leave all the rails in the cups and cross the timers in 38.85 seconds – just over a second off the winning time of 37.68 set by American, Tali Dejong and Amadeus. Taking fourth place was Jenna Lee Gottschlich, 14, of Edmonton, AB. Riding Casper (Wizzerd WV x Karlstad), her 10-year-old Dutch Warmblood gelding, she lowered one rail for four faults in the initial round. More information on NAJYRC 2017 can be found at www.youngriders.org.